Girl? Well that is what the doctor told me today. When she finally had a good view she said "it's a girl." Nick then asked her how her acuracy is. The doc said "not good." 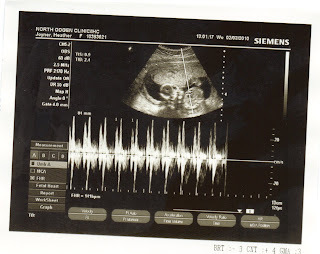 So my next appointment is the first of March along with an ultrasound. So hopefully we'll have a better idea by then. 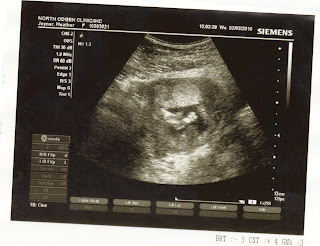 I do have a strong feeling that it is a girl, especially since I've had dreams of our baby being a girl. 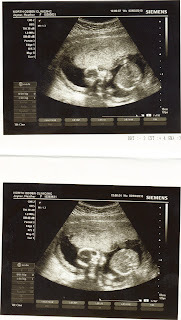 Here are some ultrasound pics for your enjoyment. We are just so glad that are baby is doing so well and is very healthy! Yeah!! I am so excited for you!! I have TONS of clothes if you need any, just let me know! We are very, very excited for you. Hope you are feeling better! YES!! SO EXCITED FOR YOU! Can't wait to see her! Glad she is doing so well and is so healthy! What a blessing! whoa where have i been? I didn't know you guys were expecting! girls are awesome! WE highly recommend them! We need to get together soon!